One never knows… Merry Christmas! 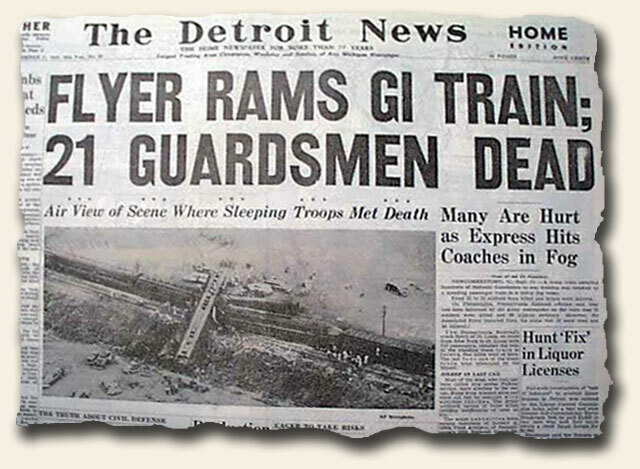 Richard Storrs was in the military in 1950 and had the unfortunate fate of being on a train as it traveled through Ohio when it was rammed by another. 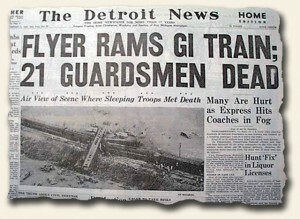 “221 Guardsman Dead” was the headline of the “Detroit News” of Sept. 11, 1950. Richard Storrs was among the survivors, but he injured his leg causing a disability. He never received pension benefits from the incident, perhaps not believing it was possible as the years passed. But a prompt from others to pursue let to the need to prove the incident happened. Searching online in 2010 the Storrs’ found our website, which by good fortune happened to have the mentioned newspaper with details of the report on the front page. With this evidence his proof was secured and he was not only able to get pension benefits, but payments missed over the previous 60 years. One never knows how our newspapers are actually used. We assume only collectors treasure them for historical information related to their interests, but obviously they can provide to be the missing link to family events, solve historical conundrums, and evidence needed to right a wrong from many years past. The heros of this story are the “others” who will likely forever remain nameless, who saw a friend in need and prompted him to take action. Who can we be an “other” to during this wonderful season? We may never know the results of our kindnesses, but there is Someone who certainly will… and regardless, a child of God will be blessed.